The tracks and circular pattern in the soil leading up to Yogi were part of Sojourner's soil mechanics experiments, in which varying amounts of pressure were applied to the wheels in order to determine physical properties of the soil. 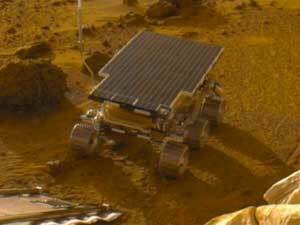 During its traverse to Yogi the rover stirred the soil and exposed material from several centimeters in depth. This 8-image mosaic was acquired during the late afternoon (near 5pm LST, note the long shadows) on Sol 2 as part of the predeploy "insurance panorama" and shows the newly deployed rover sitting on the Martian surface. 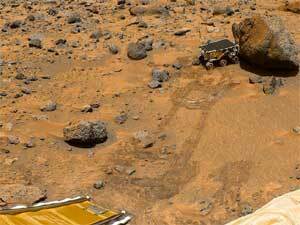 Pathfinder landed on Mars in 1999.